In this eLearning era, microlearning (also bite-sized learning) is a growing trend. It is less time-consuming and more efficient than traditional longer-duration courses. Learners love it, and so do educators. 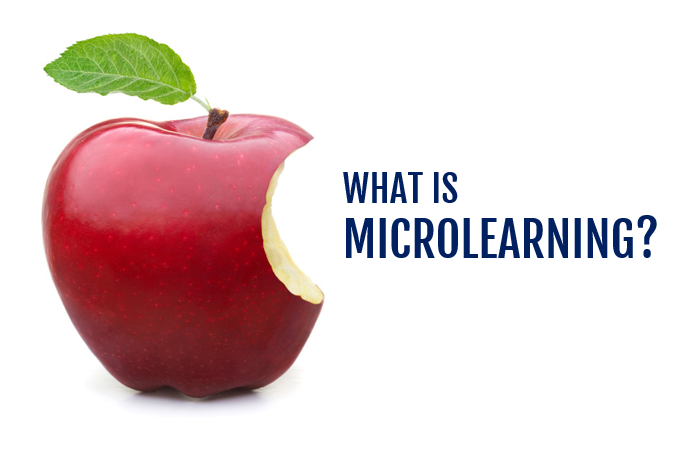 As the name implies, microlearning or bite-sized learning is learning in small doses (“micro”). A microlearning module is both bite-sized, focused, and digestible. It’s often three to five minutes long with short bursts of information that emphasize a particular topic or task. Thanks to microlearning, learners no longer need to sit in long and boring seminars, lectures, or presentations. They can now find time to learn in their tight schedules. Even when in dead time such as long commutes, learners can still grasp a microlearning module and fill the gap. Briefness: A module should be as concise as possible while adequately covering a single learning objective. Focusedness: Involve narrow topics with need-to-know information. The modules should be specific and to-the-point. Standalone nature: A microlearning module is independent and self-sufficient. It does not require access to any other training/learning modules. However, because of limited scope, a module should be part of a whole eLearning course. Variety: Come in various types such as short videos, podcasts, flashcards, mini quizzes, infographics, interactive PDFs, or small nuggets of information via email. This varies learning experiences and increases learner interest. Interactivity: Bite-sized learning includes as much interaction as possible to get learners involved and engage them. Interaction can come from simulations, clickable walkthroughs, drag-n-drop interactions, etc. Flexibility: Microlearning is designed to work on multiple devices, from smartphones, tablets, laptops, and PCs. It’s accessible on any device, at any time when learners get a little spare time on their hands. Short modules cannot cover much. But microlearning turns short duration to good advantage. A module covers just one learning objective in bite-sized forms. It filters out the redundant or unnecessary content while focusing on the need-to-know one. That way, it both avoids overwhelming learners and increases the ability to absorb and retain information. In addition, microlearning prevents learners from wasting time in searching for what they need. Why? Because it provides specific and targeted information. Thereby, the time spent is all for learning, not for busying themselves with tons of information. #2: It emphasizes just-in-time learning. No one wants to sit through an hour-long presentation on dry topics such as company standards and policies, or even on interesting topics like communication skills. Many organizations also cannot afford to take employees away from work for training. This is where microlearning for just-in-time learning comes in. Learning becomes available on-demand and in the moment of need. Learners can take it at their own pace when they are ready. Moreover, by accessing relevant, targeted information just in time, learners can quickly get what they need. Therefore, they can quickly tackle an instant problem or challenge and fill the performance gap. For that reason, microlearning is perfect for corporate eLearning environment where training is centered on knowledge transfer. #3: It boosts retention rates and recall. The human brain absorbs and retains information better in smaller bits. German researchers reported in 2015 that microlearning improved the retention rates by 20%. Their research also found that microlearning made learners take 28% less time to answer questions. Besides, scientists discovered that human brains couldn’t maintain focus for long periods of time. You humans have short attention spans of just eight seconds. So studying small chunks in short focused bursts is an optimal solution. Microlearning chunks huge piles of information down into bite-sized nuggets. It gives learners digestible and to-the-point information that they can apply right away. That way, they constantly process, reflect on, and evaluate the information. #4: It’s perfect for mobile learning. In this mobile world where schedules become more hectic, people want on-demand learning with the quick and efficient information the second they need it. They want to learn anywhere, anytime, and on the device of their choice. It can be a smartphone, a tablet, or any other handheld devices where they can find an infographic, for example, to fill up their few spare minutes. Because of this, microlearning with its short, concise, and relevant content is ideal for mobile learning. However, the key reason for this deadly combination is fluidity. Created in HTML5, microlearning is both adaptive, responsive, and mobile-friendly. Therefore, it’s a true learning strategy for facilitating convenience and flexibility for learners in today’s fast world. Tip: Having an effective authoring tool like ActivePresenter enables you to create truly responsive courses with ease. Microlearning has the advantage in capturing learner attention. It comes in various types, thus varying learning experiences and increasing learner interest. You can find it in the form of a short video, a podcast, a mini quiz, an infographic, or a small nugget of information via email, etc. More importantly, those diverse types are loaded with interactions and rich media which get learners involved, attract and hold their attention every few minutes. Furthermore, bite-sized learning is a practical approach to the Millennials’ learning style. This “digital native” generation has grown up with the Internet, smartphones, and tablets. As a result, they want learning to be brief, accessible, instant, relevant, and of course, engaging. Thanks to brief duration, microlearning requires less time and resources for preparation and delivery. So, the development cycle shortens and production cost goes down. Also, it’s easier to update a module as a result of its modular design. Updating a specific module doesn’t affect the other modules, which appears as a big fat plus point to businesses. The 2016 Towards Maturity Research revealed that 87% businesses wanted to reduce learning cost. At the same time, the practical uses of microlearning vary. It can be a standalone learning module or part of a bigger, full-fledged course. Related bite-sized modules can be combined to build a comprehensive curriculum. Regarding the learning cycle, microlearning is suitable for many stages from pre-training, during-training to reinforcement. It can’t help but say that microlearning delivers great value at minimum cost. #1: It doesn’t fit complex tasks or skills. Bite-sized learning is meant for easily digestible “micro” topics and tasks. It aims at rapid and effective online learning tailored for hectic schedules. For this reason, it’s not the best choice for complex tasks or skills. More thorough coursework, such as compliance topics, requires more time and effort to master. You cannot to understand the whole in just three to five minutes. That said, bite-sized learning can still be used as supplemental resources for full-length courses. Short modules can add value to your course by reinforcing the key messages and important points. For example, an employee can watch a three-minute video or a short presentation for a quick refresher. #2: It can end up as content fragment. Each self-sufficient module gives learners small but targeted information. This is a real benefit but at the same time causes potential weaknesses. It may be difficult to tie pieces together or find the connection between them. 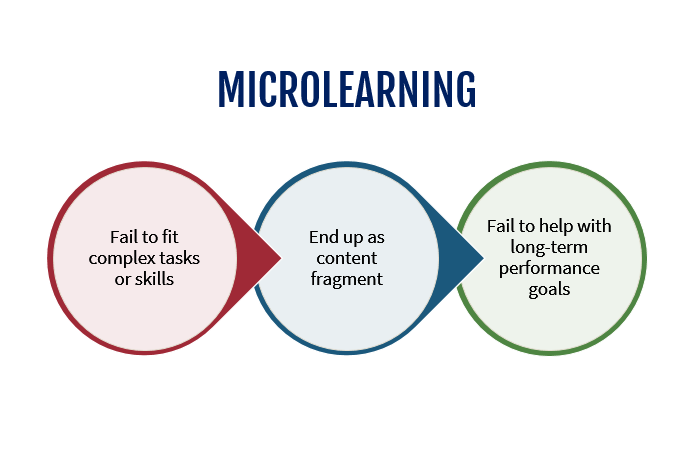 Thus, microlearning experiences can easily end up fragmented and disconnected. This brings about the possibility that learners cannot reflect on and assimilate the overall picture. To avoid this drawback, don’t merely cover one facet of the concept or idea. Instead, you should connect every module within your course in some way, yet ensure each is separate and independent. Try to let learners see the forest for the trees. #3: It may fail to help with long-term performance goals. Microlearning is for moment-of-need learning to master simple tasks or individual skills. A single microlearning experience doesn’t fit a more complex topic with a variety of steps, skills, and tasks involved. For this very reason, microlearning becomes less effective when it comes to long-term goals where learners have to dig deep into them. Having said that, the simple tasks or individual skills do build into the more complex process and eventually add up at the macro level. In fact, you can combine microlearning, spaced repetition, and distributed practice as part of a broader course to reinforce long-term retention. Should we follow the trend of Microlearning? The answer is YES. 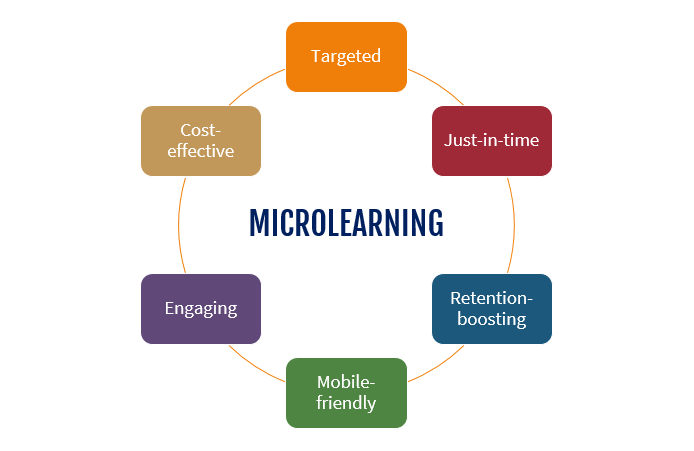 Microlearning or bite-sized learning is perfect for this today’s fast world of mobile learning and tight schedules. It gives you concise, accessible, and need-to-know information in the moment of need. Despite that, it’s essential that you limit its use where it’s most effective. Don’t overuse or misuse it. And to start, you need a rapid authoring tool to bring your idea to life. We’ve got you covered with ActivePresenter – the ultimate solution for eLearning authoring.